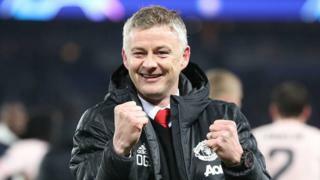 Manchester United on Thursday confam di appointment of Ole Gunnar Solskjaer as permanent manager for di club with three-year contract. Solskjaer first be caretaker manager for di club afta e replace Jose Mourinho wey chop sack for December 2018. "From di first day wen I arrive, I feel at home for dis special club. Na honour for me say I be Manchester United player before, and to start my coaching career here. Di 45 year old spend 11 years as player for United, and na im score di winning goal for 1999 Champions League final. "My experience dis last months dey fantastic." Di club manager add. Wen dem appoint Solskjaer as caretaker manager for December, Man United dey sixth position for English Premier League and 11 points behind di top four. Solskjaer na di first United manager to win im first six league games, im break Sir Matt Busby record. Under im leadership, United reach di quarter-finals of di Champions League for di first time since 2014, afta dem knock out Paris St Germain for di round of 16.